Mulching prepared beds with plastic for several weeks prior to planting can decrease weed pressure in the subsequent crop. This has been demonstrated for a variety of crops with both clear plastic (solarization) and black plastic (tarping, also known as occultation). Solarization and tarping are of greatest utility in high-value horticultural crops that would otherwise require extensive hand weeding. With either practice, the plastic may be removed prior to planting, allowing for reuse, or left in place and holes cut through it to allow for transplanting. Solarization is nothing new—it has been researched and used by growers extensively since the 1970s, especially in Israel and California. Less research has been done on tarping, which is less effective than solarization under hot, sunny conditions. 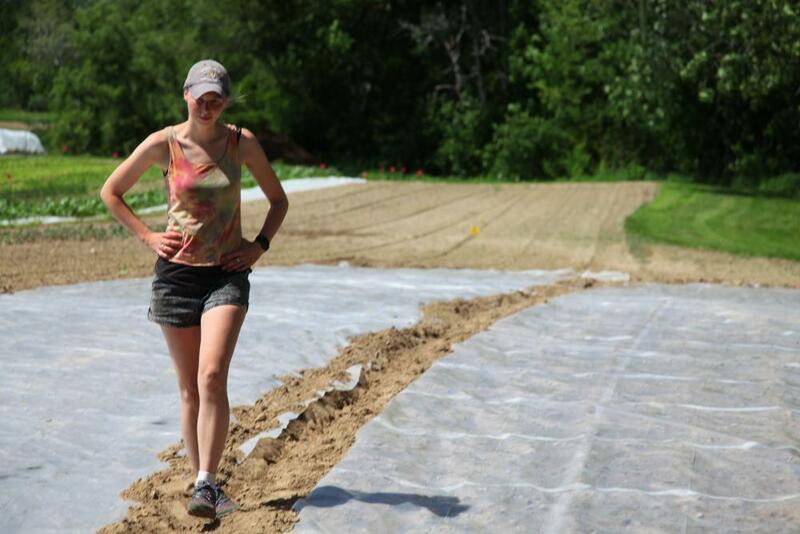 However, tarping is becoming popular among small-scale growers in our region, which is the northeastern United States. Salvaged greenhouse plastic applied to solarize a field in Old Town, ME. Photo credit: Eric Gallandt, University of Maine. Thermal killing due to heat buildup from the sun has been considered the primary way solarization and tarping work, i.e., deplete the weed seedbank by killing weed seeds and seedlings (Rubin and Gamliel, 2018). However, these practices can also work at sub-lethal temperatures, and we have not yet figured out why. The light-blocking effect of black plastic is almost certainly a key mechanism in tarping. For both tarping and solarization, raising soil temperatures might promote suicidal germination of weed seeds, or hasten seed degradation due to increased rates of microbial and chemical processes in the soil (Cohen and Rubin, 2007). Increased soil moisture can improve the effectiveness of solarization and tarping for several reasons. Moist weed seeds are more susceptible to thermal killing than dry seeds (Egley, 1990), and moisture may stimulate suicidal germination. Water also increases conductance, allowing heat to be carried down into the soil profile to reach more deeply buried seeds, literally deepening the impact of these practices. The most obvious difference between solarization and tarping is light penetration through the material. Because light is an important cue for germination of many weed species (Baskin and Baskin, 1998), the light-blocking effect of tarping could keep some weeds dormant that would germinate under solarization in sub-optimal heating conditions. Though some people find this fact counterintuitive, solarization actually results in hotter soil temperatures than does tarping (Fig. 1), due to the physics at work in each practice (Mahrer and Shilo, 2012). During solarization, light waves penetrate the clear plastic, directly heating the soil below. Heat is then retained under the plastic through a greenhouse effect. During tarping, solar energy is absorbed by the black plastic, with some heat being transferred down into the soil and some lost back up into the surrounding air. Applying a double layer of clear plastic, or clear on top of black, can further increase temperatures and effectiveness (Mahrer and Shilo, 2012). Figure 1. 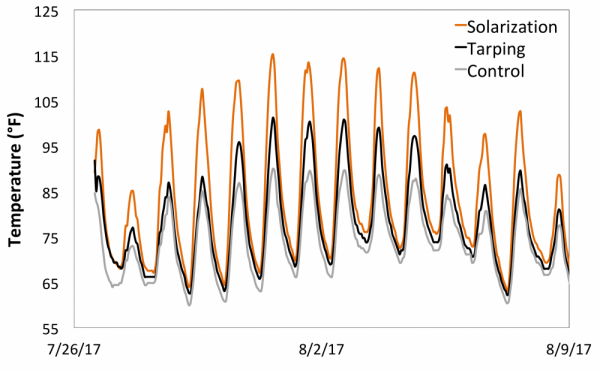 Average soil temperatures at 2” depth during two weeks of solarization, tarping, and uncovered control treatment in Old Town, ME. Many studies have found that under the right conditions, solarization provides excellent weed control. For example, three weeks of solarization in Brazil controlled more than 50% of weed species and doubled carrot yield (Marenco and Lustosa, 2000). Solarization was not believed to work well in cool, northern climates, but our recent research challenges that assumption. We conducted four experiments plus two on-farm trials in Maine and found that overall, solarization followed by flaming reduced subsequent weed emergence by 78% in comparison to a control that was flamed only (Birthisel et al., unpublished), suggesting that solarization created an excellent stale seedbed. We have also heard anecdotal reports that a few days of solarization after mowing annual weeds during the summer can be sufficient to kill them. Several recent book chapters include excellent summaries of the solarization research to date (Cohen and Rubin, 2007; D'Addabbo et al., 2009; Rubin and Gamliel, 2018). Solarization effect observed during an experiment conducted during May–June of 2015 in Old Town, ME. The image at left shows a plot that was tilled, irrigated, solarized for two weeks, then left fallow for two weeks. The image at right shows a plot that was tilled, irrigated, and left fallow for four concurrent weeks. Photo credit: Sonja Birthisel, University of Maine. Tarping has recently been advocated in a popular farmer publication by Fortier (2014), but there has not been much research on the topic. The few studies that exist suggest that tarping can decrease weed seed germination (Standifer et al., 1984), and result in fewer weeds than an unmulched control (Rubin and Benjamin 1983), but it is not always effective (Mudalagiriyappa et al., 1998). Field experiment comparing solarization and tarping for weed control. April 2016, Orono, ME. Photo credit: Liam Kenefic, University of New Hampshire. Table 1. Summary of experiments comparing solarization and tarping for weed control. All temperatures were measured at 2” soil depth. Weeds were measured days to months after plastic removal. See footnote for key to symbols. Some species of weeds are known to be quite resilient to solarization, and likely tolerate tarping as well. Knowing the biology of your weeds can help you make informed decisions about whether to apply these practices. In general, solarization works better on annual weeds than perennials (D'Addabbo et al., 2009). Creeping perennials such as nutsedges (Cyperus spp.) tend to be especially resilient. Among annuals, hard-seeded species like morning glory (Ipomoea spp.) are harder to control, requiring longer treatment periods. In one of our own experiments, purslane (Portulaca oleracea) germination was actually stimulated by solarization, and seedlings of this species survived up to six weeks of treatment under clear plastic. If you are interested in this topic, see Cohen and Rubin (2007) for a much more comprehensive list of weed species responses to solarization. Solarization was originally developed to help farmers control soilborne diseases, and a considerable amount of research has been done on that topic (D'Addabbo et al., 2009). Despite this, surprisingly little is known about the impacts of solarization and tarping on beneficial soil microbes and soil health. Microbial communities can be altered due to solarization (Gelsomino and Cacco, 2006), but we do not expect soil microbe populations to be irreparably harmed. Many studies show that solarization improves subsequent crop growth, perhaps due to disease suppression or increased nutrient availability (Katan and Gamliel, 2012). Because tarping heats the soil less intensely than solarization, its impacts on the soil microbial community are likely less pronounced. We recommend solarizing or tarping on top of a prepared seedbed. This allows for subsequent planting with little soil disturbance, minimizing the chance of bringing up buried weed seeds that survived treatment. Preparing a seedbed can also improve soil water-holding capacity and provide a smooth surface that decreases the risk of plastic tearing (Cohen and Rubin, 2007). Apply plastic to moist soils for best results. Irrigating or waiting until after a rain can increase the effectiveness of solarization, and likely of tarping as well. Incorporating organic amendments or plant residues before solarizing can improve effectiveness. Sometimes called biosolarization, this integrative practice is a growing area of research (Stapleton et al., 2016). Organic amendments may enhance solarization by providing food for microbes, lowering the temperatures needed to kill pests, and raising soil temperatures. We expect that integrating organic amendments with tarping could be helpful as well. A variant of this practice known as anaerobic soil disinfestation (ASD) has shown promising results (Shrestha et al., 2014). As previously described, solarization causes higher soil temperatures than tarping and can be more effective for weed control (Table 1). Due to their cost effectiveness and desirable properties, polyethylenes are the plastics most commonly used: clear polyethylene for solarization, black polyethylene for tarping. Many other kinds of plastics can be employed, including porous landscape fabrics. Considerable research has been done comparing and optimizing plastics for solarization in particular (Gamliel, 2012). Mulching with polyethylenes and other non-porous materials often results in elevated levels of available nitrogen, perhaps due to a combination of altered microbial activity and reduced leaching. There are trade-offs regarding plastic thickness. Thick plastic, 4-mil or greater, is durable and may be reused for several years. Reuse can be practical at small scales, where it is feasible to remove and fold or roll plastic up manually. For single-year applications, thin films are usually preferred, as they are less expensive and result in less waste compared to thicker, single-use films. For the small-scale grower, solarization can be a great use for salvaged greenhouse plastic. In our own solarization experiments, we had good success with 6-mil polyethylene salvaged from greenhouses after 3-6 years of use. Provided it is free of holes, used plastic can work very well. One study found that year-old polyethylene actually worked better than new for solarization (Avisser et al., 1985). For tarping, heavy duty silage tarps are popular. For farmers growing at larger scales, it may be practical to invest in specialized solarization films that optimize light penetration, trap heat efficiently, and have anti-drip properties (Rubin and Gamliel, 2018). These can, but do not always, translate to improved weed control outcomes. Laying plastic in strips can work, but broadcast application over a whole field may make solarization and tarping even more effective, since it decreases heat loss from edges and avoids leaving bare ground where weeds can survive. At small scales, plastic can be applied over a whole field manually. Expensive machinery that hot-air welds or glues strips of plastic together has been developed for use at larger scales (Rubin and Gamliel, 2018). At least for solarization, tightly securing plastic edges leads to better results. 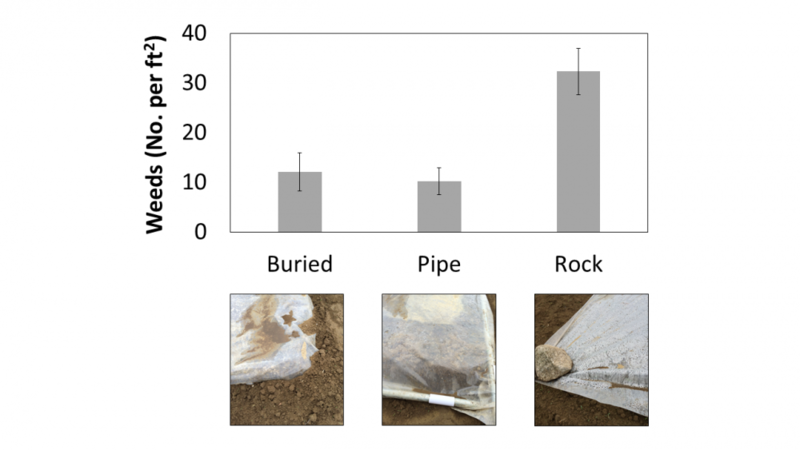 We conducted a field experiment in 2015 to test whether there was a difference in solarization effectiveness based on whether we buried plastic edges, secured them with long pieces of metal pipe laid in trenches, or placed rocks every yard along edges. We solarized for two weeks, removed plastic, and then counted weeds two weeks after plastic removal. Significantly more weeds emerged in the treatment where edges were secured with rocks (Fig. 2). The other treatments provided a better seal, leading to hotter soil temperatures and better subsequent weed control. Figure 2: Average weed emergence following plastic removal when solarization was performed with three different methods of securing plastic edges. Methods are pictured below their corresponding bars. Photo credit: Ana Eliza Souza Cunha, University of Maine. Check with your USDA-approved certifier to ensure that solarization and tarping are allowed under your state and local organic certification standards. Temporary (in-season) use of these practices is allowed under NOP. Solarization with clear plastic and tarping with black plastic are useful weed management practices for high-value horticultural crops. Solarization tends to be more effective so long as conditions are suitably warm and sunny, though tarping may be more suitable for some applications. Prepare a smooth seedbed before applying solarization or tarping. Apply plastic when soil is moist —irrigate or wait until after a rain. Tightly secure plastic edges—especially for solarization. Minimize soil disturbance after removing the plastic so as not to bring up new weed seeds from below. Consider incorporating organic amendments prior to plastic application. Abu-Irmaileh, B. E., and S. Thahabi. 1997. Comparative solarization effects on seed germination of Cuscuta and Orobanche species. p. 227–235. In J. J. Stapleton, J. E. DeVay, and C. L. Elmore (eds.) Proceedings of the Second International Conference on Soil Solarization and Integrated Management of Soilborne Pests, Aleppo, Syria. 16-21 March 1997. FAO Plant production and protection paper 147, Rome, Italy. Avissar, R., O. Naot, Y. Mahrer, and J. Katan. 1985. Field aging of transparent polyethylene mulches: II. Influence on the effectiveness of soil heating. Soil Science Society of America Journal. 49:205–209. Available online at: https://doi.org/10.2136/sssaj1986.03615995005000010039x (verified 24 Aug 2018). Baskin, C. C., and J. M. Baskin. 1998. Seeds: Ecology, biogeography, and evolution of dormancy and germination. Academic Press, San Diego, CA. Cohen, O., and B. Rubin. 2007. Soil solarization and weed management. In M. K. Upadhyaya and R. E. Blackshaw (eds.) Non-chemical weed management: principles, concepts and technology. p. 177–200. CABI, Cambridge, UK. D'Addabbo, T., V. Miccolis, M. Basile, and V. Candido. 2009. Soil solarization and sustainable agriculture. In E. Lichtfouse (ed.) Sociology, organic farming, climate change and soil science. Available online at: https://www.researchgate.net/publication/226312384_Soil_Solarization_and_Sustainable_Agriculture (verified 24 Aug 2018). Egley, G. H. 1990. High-temperature effects on germination and survival of weed seeds in soil. Weed Science 38:429–435. Available online at: https://www.jstor.org/stable/4044899?seq=1#page_scan_tab_contents (verified 24 Aug 2018). Fortier, J.-M. 2014. The market gardener. New Society Publishers, Vancouver, Canada. Gamliel, A. 2012. Plastic films for soil disinfestation: Chemistry and technology. p. 165–173. In A. Gamliel and J. Katan (eds.) Soil solarization: Theory and practice. American Phytopathological Society, St. Paul, MN. Gelsomino, A., and G. Cacco. 2006. Compositional shifts of bacterial groups in a solarized and amended soil as determined by denaturing gradient gel electrophoresis. Soil Biology and Biochemistry 38:91–102. Available online at: https://doi.org/10.1016/j.soilbio.2005.04.021 (verified 24 Aug 2018). Horowitz, M., Y. Regev, and G. Herzlinger. 1983. Solarization for weed control. Weed Science 31:170–179. Available online at: https://www.jstor.org/stable/4043790 (verified 27 Aug 2018). Katan, J., and A. Gamliel. 2012. Mechanisms of pathogen and disease control and plant-growth improvement involved in soil solarization. In A. Gamliel and J. Katan (eds.) Soil solarization: Theory and practice. p. 135–145. American Phytopathological Society, St. Paul, MN. Mahrer, Y., and E. Shilo. 2012. Physical principles of solar heating of soils. p. 147–152. In A. Gamliel and J. Katan (eds.) Soil solarization: Theory and practice. American Phytopathological Society, St. Paul, MN. Marenco, R. A., and D. C. Lustosa. 2000. Soil solarization for weed control in carrot. Pesquisa Agropecuária Brasileira 35:2025–2032. Available online at: https://doi.org/10.1590/S0100-204X2000001000014 (verified 27 Aug 2018). Mudalagiriyappa, H., V. Nanjappa, and B. K. Ramachandrappa. 1999. Effect of soil solarization on weed growth and yield of kharif groundnut (Arachis hypogaea). Indian Journal of Agronomy 44:396–399. Available online at https://www.researchgate.net/publication/290020973_Effect_of_soil_solarization_on_weed_growth_and_yield_of_kharif_groundnut_Arachis_hypogaea (verified 27 Aug 2018). Rubin, B., and A. Benjamin. 1983. Solar heating of the soil: Effect on weed control and on soil-incorporated herbicides. Weed Science 31:819–825. Available online at: https://www.jstor.org/stable/4043913 (verified 27 Aug 2018). Rubin, B., and A. Gamliel. 2018. Soil solarization: A sustainable method for weed management. p. 303-318. In R. L. Zimdahl (ed.) Integrated weed management for sustainable agriculture. Burleigh Dodds, Cambridge, UK. Shrestha, U., A. Wszelaki, and D. Butler. 2014. Introduction to anaerobic soil disinfestation as a fumigant alternative. University of Tennessee Extension. Available online at: https://extension.tennessee.edu/publications/Documents/SP765-A.pdf (verified 27 Aug 2018). Standifer, L. C., P. W. Wilson, and R. Porche-Sorbet. 1984. Effects of solarization on soil weed seed populations. Weed Science 32:569–573. Available online at: https://www.cambridge.org/core/journals/weed-science/article/effects-of-solarization-on-soil-weed-seed-populations/C277D5C369D350CD1EBAC202AC1A5C0C (verified 27 Aug 2018). Stapleton, J. J., R. M. Dahlquist-willard, Y. Achmon, M. N. Marshall, S. Jean, and C. W. Simmons. 2016. Advances in biosolarization technology to improve soil health and organic control of soilborne pests. p. 1–6. In Proceedings of the organic agriculture research symposium, Asilomar, CA. Available online at: https://www.researchgate.net/publication/309284973_Advances_in_Biosolarization_Technology_to_Improve_Soil_Health_and_Organic_Control_of_Soilborne_Pests (verified 27 Aug 2018).